Just yesterday, during Amazon's hallowed Prime Day sales, the ad-laden version of this phone was on sale for $179.99. While that's a fantastic deal, some people just aren't OK with having their lock screen telling them to buy things. 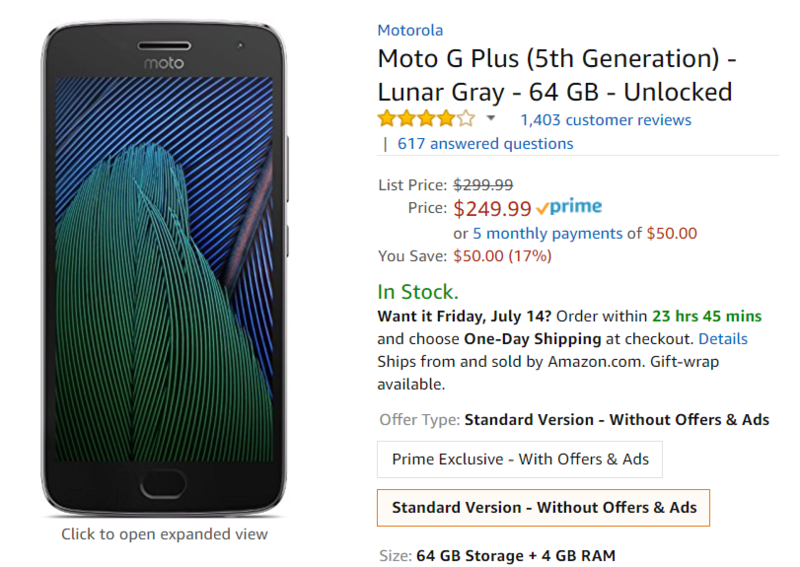 For those of us that might prefer a less corporate phone experience, or who prefer an unlockable bootloader, right now you can pick up the same 64GB Moto G5 Plus without ads for just $249.99, or $50 off. The G series has always been a great value. While ads bring the price down even lower, if you just can't stomach the minor intrusion, or you are desperate to flash a ROM, the version sold without Amazon's "Offers & Ads" might be more to your preference. And it's a great device. We didn't proclaim it the king of the budget phones for no reason, after all. For $249.99 you get a Snapdragon 625, 64GB of storage, 3GB of RAM, a 5.2" 1080p display, a 12MP camera, fingerprint reader, and Android 7.0 Nougat. For the price, the specs are quite reasonable. The only potential impediments to a good time might be Lenovorola's history with updates, the dated microUSB connector, and a lack of NFC. If you are excited to pick up an ad-free unit but were waiting for a deal to grab one, this is it.